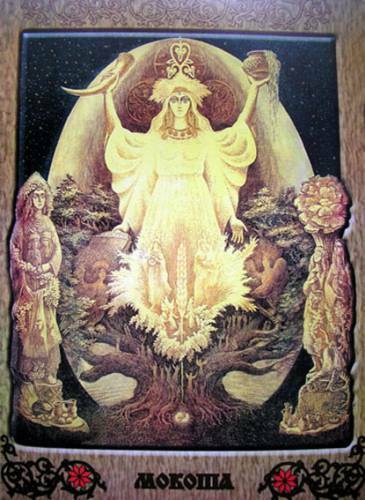 Mokosh, also called Mokos, a Goddess of the Earth, was worshipped by the ancient Slavs. She is one of the most primeval deities in Europe. As is true in many countries where reconstructionist Paganism is blossoming, there is currently a significant revival of pre-Christian spirituality and folk traditions in the lands that were formerly dominated by the Soviet Union. Hence, Her presence is being remembered and honored openly once more. Mokosh – Goddess who gives and takes life, spinner of the thread of life, giver of the water of life. Also known as Mokysha, Mokush. She later evolved into Paraskeva-Piatnitsa – a Goddess of spinning, water, fertility, and health with marriage. As the only female God of note to be worshipped by the Slavs, Mokos assumed a broad range of divine roles. She was first and foremost a symbol of the earth’s fertility. During the early spring, it was taboo to spit on or strike the ground, since Mokos was said to be pregnant then….Holidays were dedicated to Her in the autumn, after the harvest. 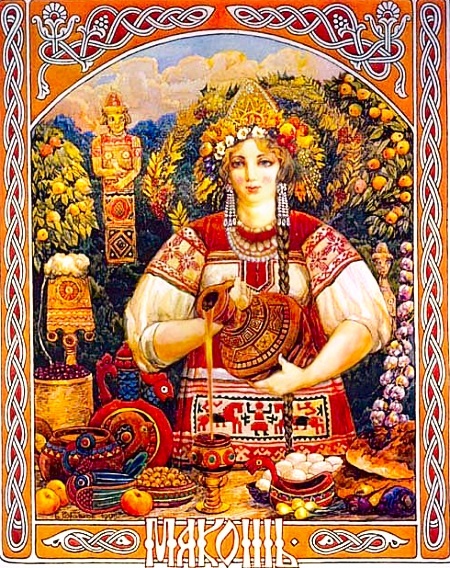 The belief that Mokos invested the earth with divinity was reflected in peasant practices that, in some parts of Russia, Ukraine, and Belarussia, persisted into the 19th century: the swallowing of a lump of soil to consecrate wedding vows, the placing of earth upon one’s head to seal oaths, the confession of one’s sins to a hole in the ground instead of a priest. In fact, Mokosh is the only female deity mentioned in the Kievan pantheon that was established by Vladimir I in 980 CE. In northern Russia, She has survived as a house spirit, Mokysha or Mokusha; a tall woman with a large head and long arms. Known throughout Romania, Russia, Poland, Czechoslovakia and the Ukraine, Mokosh can be either benevolent or malevolent. She is linked to the waters of the sky and the moist soil, to the fertility of the Earth and its creatures, to spinning and weaving, and to fishing. Images of Her survive to this day in Russian art and embroidery. She is related to Hecate and Aphrodite in classical western mythology, to Goddness Lakshmi in Indian myphology and to Zhyva and Morena in the western Slavic mythology. In the Russian Orthodox tradition She became intertwined with Saint Paraskevia (from the Greek paraskevi, which means “Friday,” a day that was always associated with the Goddess.) Later, especially under the attempted secularization of the people of the Soviet Union, Her name became synonymous with the good black soil of Mother Russia. my didiji ….. This wonderful article proves that our mother is the Universal Mother . She has taken birth in different forms in different Country.I got surprised when i read ur blog. Nice art in the picture… Some of the words like Mati etc, resemble hindi and sanskrit words! All the ancient languages might have had a common beginning, or influenced each other , I guess. Rituals are imporant in many ways, also in relationships, however I can’t agree here. A mere riual gives nohing to me, if I don’t feel good vibraions from it. And most rituals I have seen – don’t give me that. this is the case of many customs followed here, especially in India where people are very conditioned.